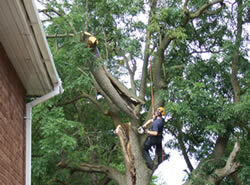 Our arboricultural services include work with trees and the felling of trees whether in difficult positions, overhanging buildings or in open parkland. After receiving your enquiry we will provide a free of charge written quotation, using clear language to explain the work to be undertaken. Our staff are fully trained and supervised to ensure your trees receive the appropriate style of cuts to ensure tree vigour is not affected by the operations and to ensure the long term impact of surgery is beneficial. It is our aim to create a balanced and well formed crown but achieving this will depend on the age and condition of the tree upon which we are working. Generally crown work and sectional dismantling is achieved through the use of ropes and climbers but we will on occasions use mechanical assistance from cranes, mobile work platform and other plant. We will asses the most efficient system of work for your situation.